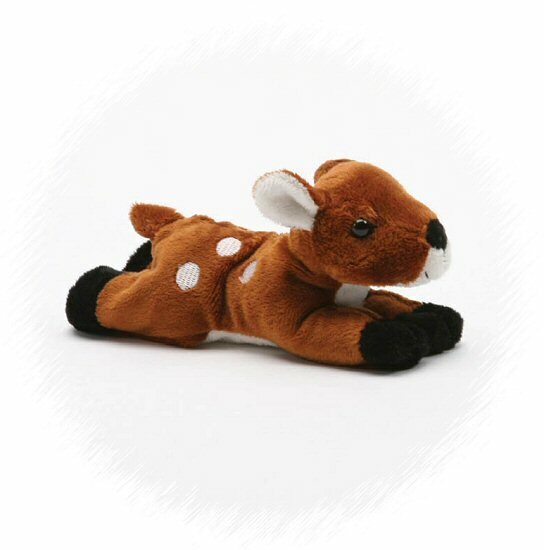 Part of the take-along-size Handfuls collection, this adorable little stuffed fawn has soft rust-brown fur with white accents, black hooves, embroidered white spots, and brown eyes in a sweet smiling face. Not skittish in the least, this cuddly plush fawn is a deer that is excited for imaginative adventure and will be dear to you as a life-long friend. Fawne, this adorable little Mini Flopsies stuffed deer, has oh-so-soft light brown fur with cute white spots and white accents. This sweet plush deer has a huggable body of soft light brown fur, white accents, and stately suede antlers. Cranberry, this adorable Li'l Sweet & Sassy stuffed fawn, has soft fur in various shades of pink and beautiful sparkly blue eyes.